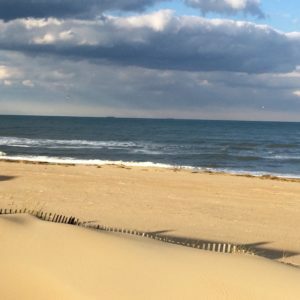 How Will Coastal Hazards Impact Tourism to the Outer Banks? Photo courtesy of E. Seekamp. During the summer months of 2016, Karly Bitstura-Meszaros and Matthew Jurjonas ventured to the Inner Banks (IBX) and Outer Banks (OBX) regions of North Carolina. Karly and Matt’s 4-5 day excursions were balanced with enjoying what draws visitors to this region: fish tacos, beach activities, live music, and coastal culture. Commonly opening with “did you see the dolphins?,” Karly and Matt intercepted visitors to survey them on where they are going and what they plan to do while on the coast. The survey also captured visitors’ perceptions of how coastal management and storm damage might impact their travel plans. The coastal hazards they asked visitors about manifest as disruption in transportation flows from closed roads and canceled ferry service, as well as closures to beaches and damaged properties. The study revealed important implications and suggestions for sustaining coastal tourism in North Carolina. Full text of the article can be found in the Coastal Hazards and Tourism: Exploring Outer Banks Visitors’ Responses to Storm-Related Impacts publication. This survey is part of the SALT research project funded by the NC State College of Natural Resources.